When you are new to the English language, it can be difficult to negotiate, help customers, and give clear instructions to staff. That's why ACT360 Media created TestDEN Business Trainer for Speaking and Writing. APRIL 14, 2009, VANCOUVER, B.C., CANADA – ACT360 Media, an international provider of Web-based language training, today launched two online courses for people who want to improve their writing and speaking skills in the workplace: Business Trainer for Managers and Business Trainer for Executives. Management Trainer focuses on the daily tasks of a manager, including 40 speaking exercises and 20 writing exercises. Executive Trainer focuses on higher level, critical-thinking skills and includes 20 speaking exercises and 40 writing exercises. Both products are based on the standards of the Test of English for International Communications (TOEIC). Here’s how it works: Learners listen or read background information as an audio file, email, fax, or text passage. 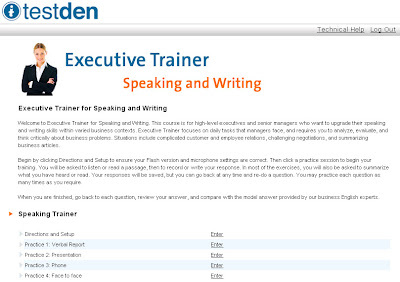 For speaking exercises, they record their voices online and the recording is stored on the TestDEN server. For writing exercises, they upload their written responses. Submissions are evaluated in one of two ways: a self-graded version (US$50) or a teacher-graded version (US$250) that includes expert marking and suggestions for improvement. Management Trainer and Executive Trainer are both available for purchase through ACT360 Media's global reseller network. Since 1998, ACT360 Media’s TestDEN.com has helped students around the world to improve their English communication skills. ACT360 Media also designs custom eLearning solutions for a global network of partners who provide language training for call centres and other organizations that need to meet international standards and become more competitive.